Fans of the Brazilian football team who were decimated in a plane crash travelling to an historic cup final turned out in force to celebrate the club’s first game since the tragedy. 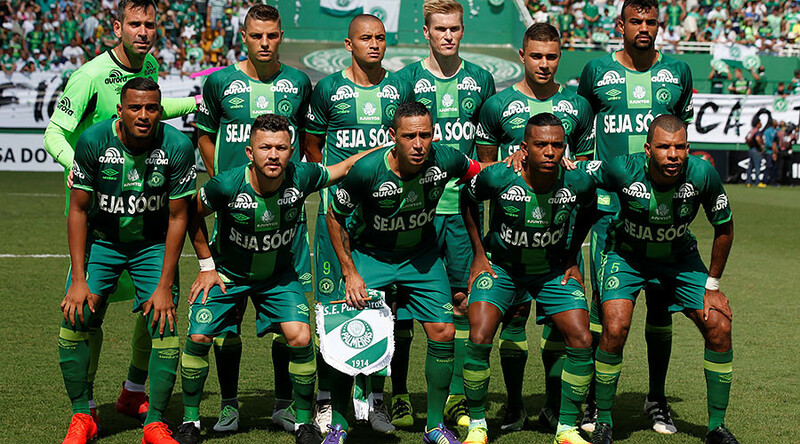 Chapecoense hosted Brazilian Serie A champions Palmeiras in their home city of Chapeco, less than two months after the disaster claimed the lives of 20 players and staff. The team’s unprecedented appearance in a Copa Sudamericana final - the second most prestigious club competition in South America - was cruelly snatched away when the aircraft carrying the team to the match ran out of fuel and plummeted into a hillside as it approached Medellin, Colombia, on November 28 last year. A total of 71 passengers were killed. Scores of fans descended on the Arena Condá stadium, Chapecoense’s home stadium, on Saturday to pay tribute to their fallen heroes and celebrate their rebuilding. The club have been frantically recruiting players in preparation for the start of the new season. Goalkeeper Jackson Follmann, who survived the crash but whose right leg was amputated as a result, led supporters in remembering those who died by carrying the Copa Sudamericana trophy onto the field prior to kick-off. Well wishers also took to social media to express their joy at Chapecoense’s return to action. “Sometimes it does not really matter where your body is, but where your heart is… And mine is in Chapecó today,” one fan wrote. “Today is a special day. An end and a fresh start,” one Instagram user wrote.